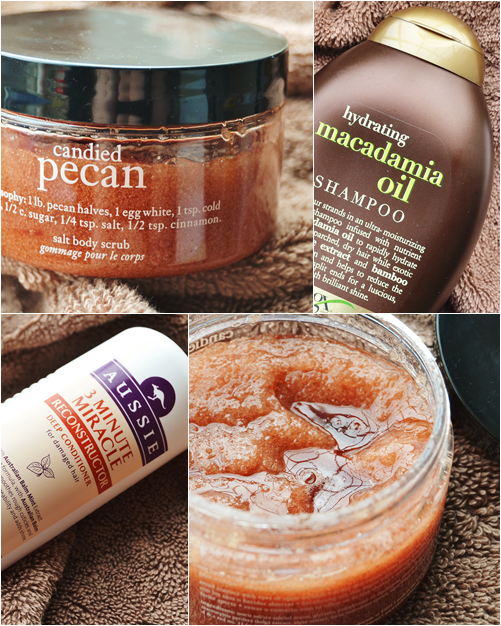 It feels like forever ago that I talked about what I've been loving in the shower/to moisturise with so with lots of products I'm loving so so much I thought I would. 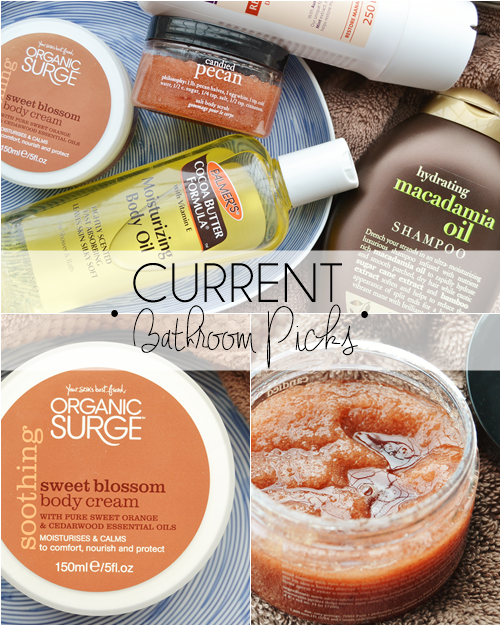 Also a lot of the products feel quite suitable for colder weather with warm scents and rich formulas. Now this is such a tease of me as this scrub is so hard to get hold of in the UK but I just had to include it because it's been making my showers so enjoyable lately. If I could describe the scent it would be that yummy smell of fresh out of the oven gooey warm biscuits - literally heaven. I actually sometimes just open the pot when I'm in the bathroom to just inhale it - it's that good! I don't really rate any other Philosophy shower products as they contain SLS's and come with some pretty scary warnings on the label, but this is thankfully free from such nasties and is a lovely scrub. A few weeks ago I decided to finally try out the Organix brand as all their shampoos are sulfate-free and I'm soooo pleased I did! When it comes to cheaper SLS-free shampoos they can be less foaming and quite drying (which equals tangles galore) but with this I was amazed. This foamed so easily like any standard shampoo and was so hydrating making it amazing for dry/over processed hair. I have a crazy amount of shampoo in my shower but this is the one I've been using religiously for the past 2 weeks. Also it comes in a huge 385ml bottle making it very worth it's money. This was a recent re-purchase after not having it for a few months and now it's back in my life I'm obsessed with it. Yes, it's mainly for the amazing bubblegum scent that I can't get enough of but it's also a great deep conditioner that really helps the ends of the hair. Also the clever squeezy non-cap end is very handy indeed. Now this very much feels like an autumn/winter body product with the yummy cocoa butter/chocolate-y scent. I've had this in the past and thoroughly enjoyed it so as I was feeling very autumnal last week I decided to pick it up again. The oil is light and spreads easily over damp just-got-out-of-the-shower skin, leaving a nourished and moisturised feel plus you will smell amazing. A must buy is you love a warm chocolate-y scent. 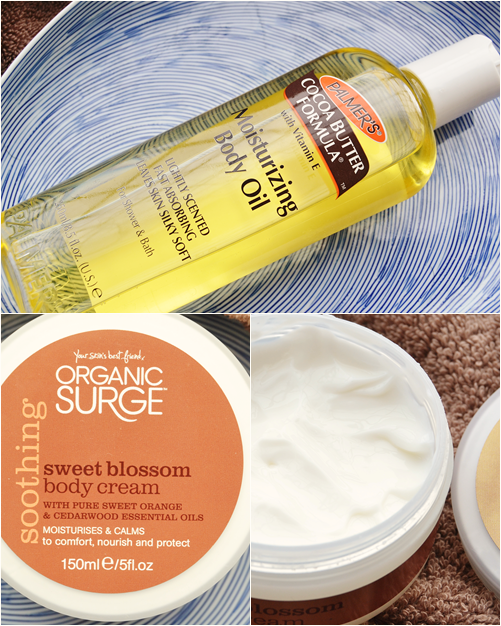 Organic Surge get it spot on with so many products and this is one of them. The Sweet Blossom Body Cream is light and sweet in scent, which is just incredible and unique, with the most luxurious feeling cream that is strangely light meaning it soaks in a treat. One of my favourite creams to apply when I feel my skin is a little dry and in need of some TLC that is definitely free from nasties. What are your favourite products to use in and out of the shower at the moment?